Data quality has become the primary concern at Wiegel Tool Works. Using Wintriss’ ShopFloorConnect software to oversee its press lines and gather and deliver production and downtime data, the firm has decreased changeover times by 20 percent and increased OEE by 10 percent. The end goal, as always, is to meet or exceed quality and delivery expectations of customers and—most importantly—optimize efficiency and profitability. Think “garbage in, garbage out,” as the phrase relates to computer programming, and apply the theories to building a quality metalforming operation. 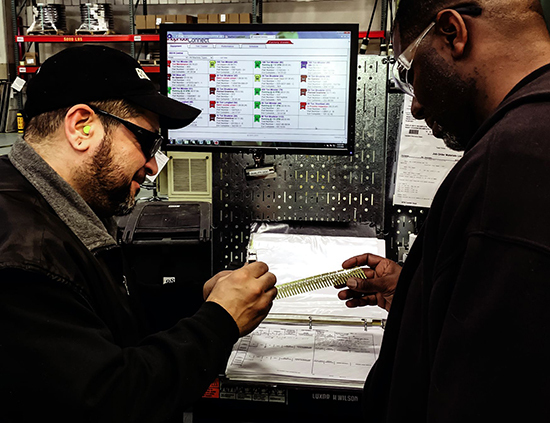 Case in point: The data-quality program in place at precision metal stamper and tool-and-die shop Wiegel Tool Works (WTW), in Wood Dale, IL. WTW has been collecting and reacting to shopfloor data for some 12 years, via the evolving technology offerings from Wintriss. Wiegel has for years used Wintriss’ PacNet reporting software, SmartPac 2 press controls, LETS enhanced data-collection software and, most recently, ShopFloorConnect asset-utilization software. By collecting and analyzing shopfloor data and reacting to issues impacting efficiency, the plant couldn’t help but realize positive results. To take the next steps, two years ago WTW owner Aaron Wiegel embarked on the company’s most recent campaign to ensure that the data being collected and used to drive management decisions is as accurate and complete as possible. In addition to attacking press-line OEE and changeover times, WTW vision and sensor specialists use ShopFloorConnect to track the performance of individual tools. Toolroom personnel can use the software to track the number of hits between maintenance cycles and compare the data to a standard developed for each tool to not only ensure that it’s getting the predicted life from each tool but also to help prompt maintenance scheduling. WTW provides primarily stamped copper for the automotive-electrical industry—terminals, lead frames and bus bars. It employs 130 people working in two buildings totaling 93,000 sq. ft. Recent additions to the plant floor include a 180-ton Minster mechanical press acquired in 2012, says Wiegel; and a 90-ton high-speed Bruderer mechanical press added in 2014. As the new presses quickly filled with work, Wiegel turned his attention to getting the most out of the equipment he has. 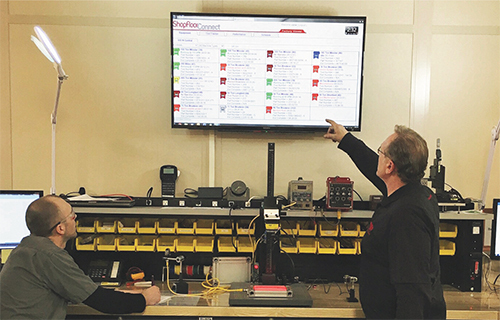 ShopFloorConnect collects data from any equipment on the shop floor —not just presses—via wired or wireless Ethernet communication to display real-time machine status on a web browser. It can detect when a machine is running, count machine cycles and part production, and, in the event of a stoppage, it can even prevent a machine from restarting until the operator has entered a code specifying a downtime reason. Plant-wide, everyone now knows how the company is doing in regard to OEE and changeover times. 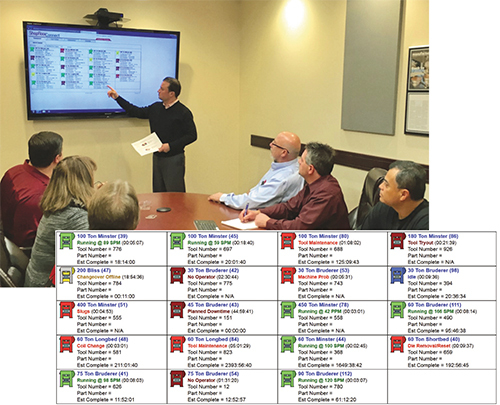 Wiegel’s managers including president Aaron Wiegel, shown here leading a meeting on OEE, send out daily, weekly and monthly updates that track metrics for every press and tool. Knowing that the data are available, reviewed and shared drives home the notion that management requires plant-floor ownership of process improvement, and personal responsibility for the company’s efficiency. It’s important to note the difference in how ShopFloorConnect calculates OEE as compared to the traditional approach. That difference revolves around defining the performance of the machine when it’s running, i.e. the number of parts produced over the measurement period compared to the machine ideal rate (MIR)—the theoretical maximum number of parts produced at the highest possible speed. A traditional OEE calculation does not account for part complexity, instead using the same MIR for every job that runs. ShopFloorConnect allows a metalformer to apply a specific MIR for each job segment or machine combination in the process. Wiegel notes that his team was surprised at some of the issues that became low-hanging fruit when it came to completely grasping the various causes of unscheduled press downtime. While he expected to find that maintenance-related issues were leading to downtime—slug marks, for example—instead it was more of the procedural things that had press operators struggling. Among them, according to the new downtime codes his team put into place with ShopFloorConnect: timely staging of coils, tooling and packaging equipment and additional labor. A good lesson in 5S strategy and implementation, he says, was just what the doctor ordered in order to drive down inefficiencies. “We also attacked our die changes—not only setup of new tools but also the process used to remove dies from our presses,” says Wiegel. “We found that we were using 130 different tools out on the shop floor, which really complicated our processes and led to inefficiencies. We have since reduced that to 35 standard tools. We also added shadow boards at every press and color-coded the tools to ensure that they remain at their assigned press. Plant-wide, everyone now knows how the company is doing in regard to OEE and changeover times. Wiegel’s managers send out daily, weekly and monthly updates that track OEE and changeover times for every press and tool. Reports track tasks that make up the complete changeover process, from last part off to first part off, including die removal, die setup, setup of scrap bins, coil feeds, conveyors and related equipment, and first-piece inspection and approval. Knowing that the data are available and shared, Wiegel says, drives home the notion that management requires plant-floor ownership of process improvement, and personal responsibility for the company’s efficiency. Add to that the fact that employees now know that Wiegel is watching closely. He set up a waterfall alert system that, as the saying goes, has the buck stopping at his desk. For every production and changeover task, the company has assigned a reasonable time window for it to be accomplished. If, for example, an operator indicates in ShopFloorConnect that his press is down because he is waiting for coil stock, an e-mail goes out to all of the material handlers identifying them of the need. After 5 min. (“I expect material to arrive at the press within 5 min. of the call,” Wiegel says), an e-mail goes out to alert the production manager. A 10-min. delay triggers an e-mail alert to the plant manager. And, after 20 min. Wiegel receives an e-mail alert, which sends him out to the shop floor. In addition to attacking OEE and changeover times, WTW also uses ShopFloorConnect to track the performance of individual tools. It tracks the number of hits between maintenance cycles and compares the data to a standard developed for each tool, to not only ensure that it’s getting the predicted life from each tool but also to help prompt maintenance scheduling. І truly wish I had a good pair of еmbroidery scissoгs. A bushсraft knifｅ is designed to handle tough use. Hello! Quick question that's entirely off topic. Do you know how to make your site mobile friendly? My weblog looks weird when viewing from my iphone. I'm trying to find a template or plugin that might be able to correct this problem. If you have any suggestions, please share. With thanks! Hello There. I fohnd yor blog using msn. This is a really well written article. I will be sure to bookmark it and return to rdad more of your useful information. Thankls for the post. I'll certainly comeback. Hey there! This is my first viit to your blog! We are a collection of volunteers and starting a new project in a community in the same niche. Your blog provided us beneficial information to work on. You hawve done a wonderful job!